I loved Graceling. So I had no doubt I was going to enjoy Bitterblue. I was actually pleased I had waited until just before it came out to read the first in the series (Fire is next on my list). I hate having to wait for the next book in a beloved series to come out. I like to devour it all at once. I’ve read a lot of subpar YA fantasy lately (I don’t review anything that I would award less than three stars on my blog) and was glad to sink my teeth into a great story. I love that the books in this series are connected, but don’t have to be read in a specific order. At the library, I hate wanting to recommend a series and not having the first book on the shelf. Each character has their own story interwoven with the main plot, even though we only see it through the eyes of Bitterblue. The conflicts of the other characters—Po and Katsa fighting about Po’s desire to reveal the nature of his Grace; Katsa fighting with Helda about why her and Po do not desire to have children; Raffin being dispatched to reject a marriage proposal; Giddon losing his estate and being exiled from the Middluns—allow the reader to see these characters dealing with their own issues. They are not merely pawns for Cashore to use to propel action in Bitterblue’s main plot along. They have lives of their own, and the way they are effortlessly woven into the plot is a tribute to Cashore’s storytelling. The political plot is superbly executed. I can’t gush about the dynamics between Bitterblue and her advisors and her subjects enough. As someone who has studied transitions to democracy after autocratic regimes that committed horrible atrocities, I see a lot of the same elements in this fantasy plot. While Leck’s reign was that much more sinister than even say, The Dirty Wars in Argentina or Stalin’s rule of the Soviet Union, since he raped the minds of his citizens and so many of his victims were young girls, the devastating effects on the people were similar. And the solution, I believe, is the same one that Bitterblue comes to in the end: a balance of healing and remembering. This is the function of Truth Commissions. The neighboring kingdom’s of Estill and Nander also illustrate the difficulty of rebuilding a nation after ousting a dictator. Luckily for Nander, they agree on a solution and the outside help they needed from the council was given with no strings attached by a benevolent group that doesn’t wish to impose its values and will on the people of Nander. In Estill, though the majority agree that ousting the King is a good thing, there is no one there to put in his place. I love YA fiction that features coming out plots or LGBTQ characters are the center of the story. 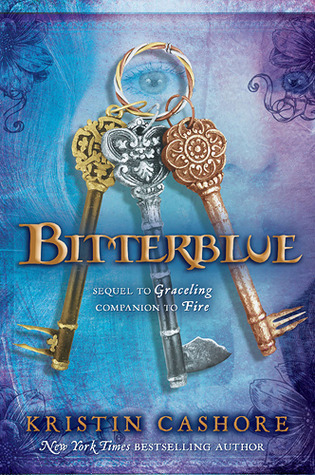 But I love Bitterblue because while there are numerous queer characters—Po’s brother Skye is revealed to have a preference for men, which is why Bitterblue rejects the idea she should marry him; Raffin and Bann are a couple, and we see a hint of the struggles of a future king who loves a commoner who he cannot produce an heir with; and Teddy and Saf’s sisters, Bren and Tilda, live together as a couple and want Teddy to give them a child—their “queerness” is not their function in the story. They are characters first, not defined by their sexual preference. And rather than being inserted for political correctness, the sexual orientation of the characters seems to affirm what Bann tells Bitterblue on page 375: “Every configuration of people is an entirely new universe unto itself.” Gender matters less than we may think. The romance is not as prominent in this story as in Graceling, which I was glad of, because if it had been a larger focus I think it would have detracted from the real plot. Bitterblue and Saf had an attraction that was based on friendship, and rather than artifical angst, a real issuedrives them apart. At the end of the book, though they aren’t together, the reader can have no doubt that they will meet again. In matters of love, timing is everything, and now is not the time for their relationship. The contrast between the different romantic relationships are a spectrum that show many happy configurations—each one negotiated in its own unique way. What is so refreshing is that outside of romantic relationships, affection is given freely without the necessity of making it sexual. Bitterblue received and gives comforting to all her friends without reservation. I love this cast of characters because they are so emotional, and even in third person, Cashore manages to reveal them to the reader. Oh, and the library! And Death the librarian! Even if I wasn’t predisposed to love this aspect of the story and this character, I think it’s amazing when an author can make such an unlikeable character—for Death is surly and condescending and not at all endearing—so completely loveable. Such a great deal of the action is not action at all, but research, and still Cashore keeps it interesting. Bitterblue is full of surprises and plot twists. It’s a compelling read, and although it is 563 pages, I finished it in two days because I couldn’t put it down. It’s a great read I’d recommend to mature young adult readers, and definitely for adults who enjoy fantasy.